DETAILS Start with a 7 inch paper plate. Out of cardboard, cut a rectangle about 2 inches wide and 11 inches long for the stem. Cut green construction paper the size of the cardboard and glue on the cardboard to form the stem. Staple stem to paper plate. Cut narrow strips of paper from a brown lunch bag or brown wrapping paper and curl by drawing the strip across one blade of opened scissors. Glue one end in the middle of the paper plate. Continue to add strips until you're happy with the look. I also added shredded brown paper which you can buy at a craft store, gluing it in the center along with the brown paper strips. 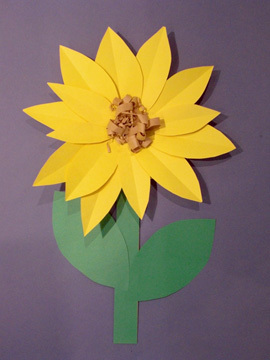 Make petals from yellow construction paper. I folded the paper and cut a skinny oval, like cutting hearts. The majority of petals are the same size with a few smaller ones on top. Glue them to the plate, slipping them underneath the brown center. The children could do all of this project or an adult could precut the petals and prepare the stem. MATERIALS NEEDED Paper plate, cardboard, staple, glue, scissors, yellow and green construction paper, brown lunch bag, or brown wrapping paper. Optional: commercially shredded brown paper.